In this page, I will be posting some of the fun stuffs (at least fun to me) that do. I have always been amazed to see I can do this kind of things with a hardware of 30 bucks and free software. 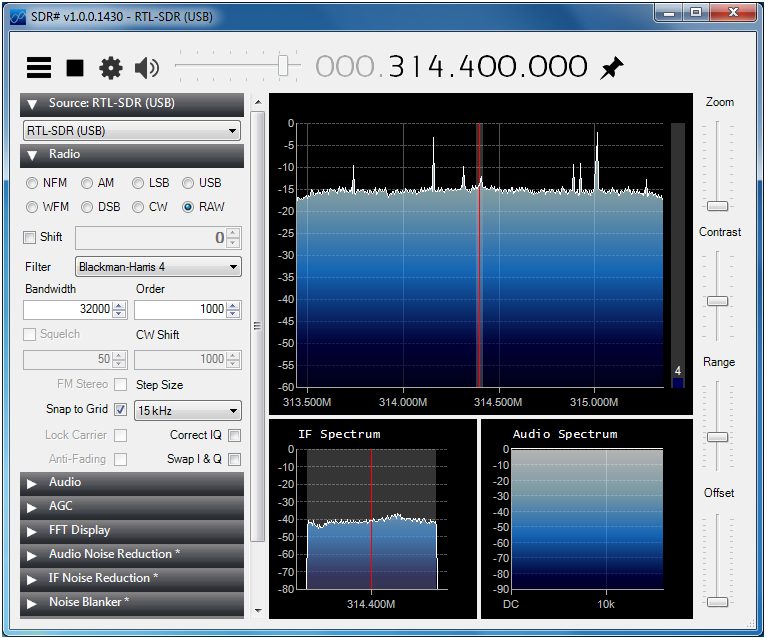 This tutorial is base on SDR Sharp v1.0.0.1430. You may see a little bit different screen but you would figure out overall logic and can apply tips here to your software even if you are using a different version. 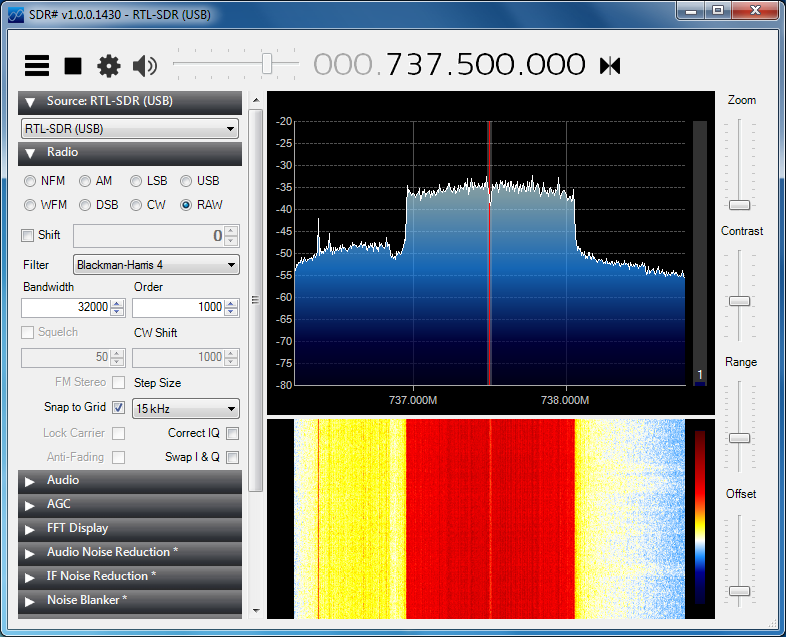 SDR Sharp has pretty good Noise Filter that you can play with. The function can be enabled as shown in (B). If you want to visualize how the filtering works, you can configure as shown in (A) and you will get the enabled spectrum at the bottom as shown in (C). In the version that I am using, it provides three different type of predefined filter as shown below. 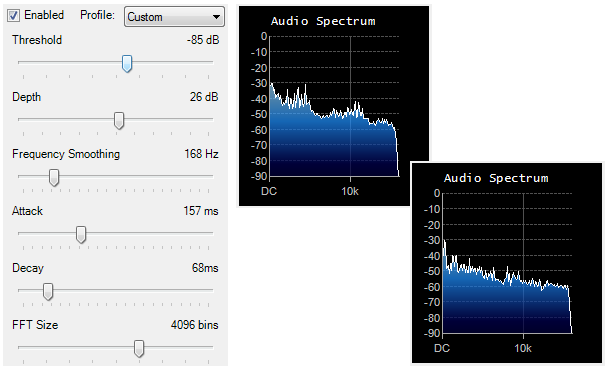 You may or may not see big differences in spectrum, but you would be able to hear about the differences. 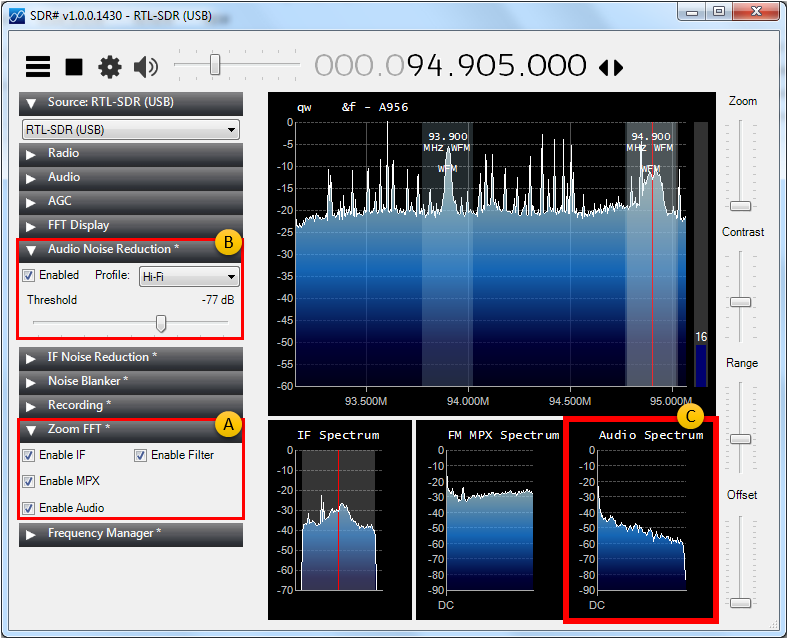 Finally SDRSharp has the filter you can customize the parameters of the filter. If you select, [Custom] profile it will give you all the parameters and you can play with these parameters and see it changes the spectrum and the quality of the audio. 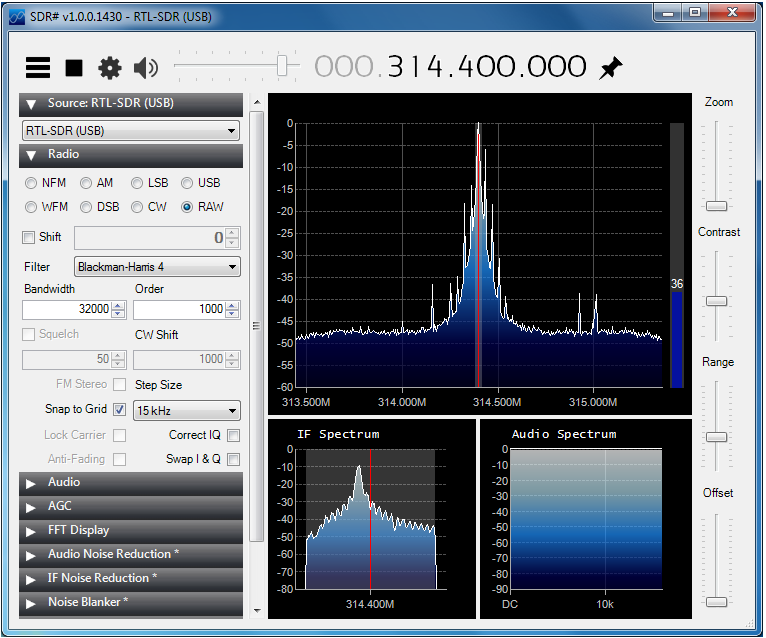 SDR Sharp has another type of filter which is at the IF stage. The operation is same as Audio Noise Reduction. I see most of applications of RTL2832 and SDRsharp that are posted on the web or YouTube are about capturing or analyzing radio broadcast, but I am not so interested in that area and I have been working with Celluar communication especially in LTE. I was wondering if I can play this with some LTE signal. Since the device that I used support only 3.2 M samples/sec, I can try with only LTE 1.4 Mhz Bandwidth. 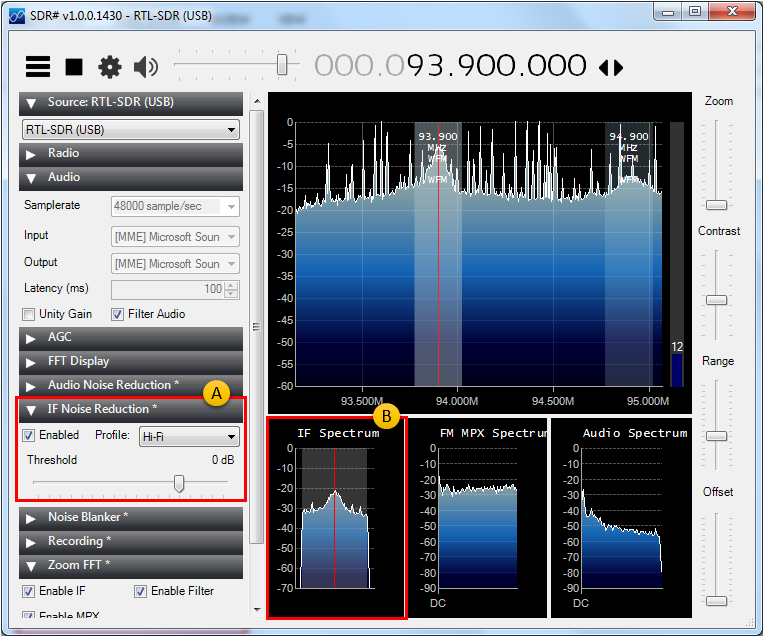 If you have any hardware supporting over 30 Mhz and 30 M samples/sec, you may have a simple Spectrum Analyzer covering all the LTE single carrier bandwidth. Of course, you would not be able to do something like 3GPP RF conformance test, but it is pretty good enough and very handy for troubleshootings in many case. Followings are snapshots for some of the trials that I did with LTE Band 12, 1.4 Mhz Bandwidth. In this test, a LTE UE is being tested with LTE Network Simulator in Radiative Link (meaning 'over an Antenna') and I sniffed the signal using RTL USB dongle. Following is the downlink spectrum when UE is in idle mode. You see pretty good SNR and not much of ACLR. Following is the dowlink signal when UE is in communication with the network simulator (after EPS Bearer Setup). You would see ACLR gets larger and it's even more higher at the left side. Following is the UL signal right after power on UE. 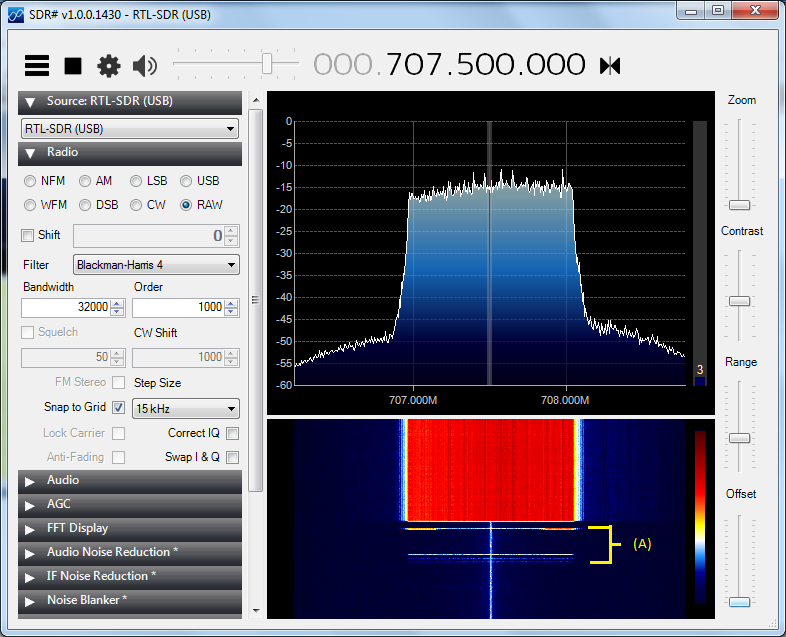 With a powerful spectrogram in SDR Sharp, you can even see the bursty signal during Attach procedure (marked as (A)) which can be very useful troubleshooting tool for attach failure case. (You may need to get RTL Device antenna a little bit farther away from UE since the RTL device is not able to handle high power).